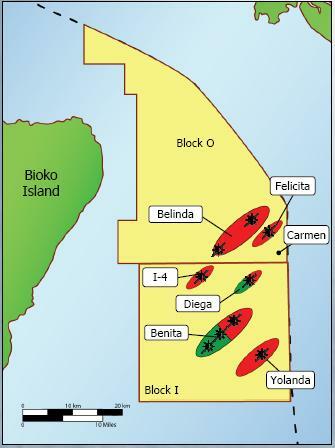 Noble Energy has announced an oil discovery on Block O at the Carmen Prospect, offshore Equatorial Guinea. The Carmen well, which represents the Company’s first oil discovery on Block O, encountered approx. 26 feet of net oil pay, along with 13 feet of net gas pay. Located in approx. 150 feet of water, the well was drilled to a total depth of 11,550 feet to test a lower Miocene reservoir. The well has been temporarily abandoned pending future development considerations. There are no plans to flow test the reservoir at the current time. Noble Energy is the Technical Operator of Block O with a 45% participating interest. Its partners on the block include GEPetrol, the national oil company of the Republic of Equatorial Guinea with a 30% participating interest and Glencore Exploration with a 25% participating interest.